While Edinburgh is full of great restaurants and eating, one of the advantages of going 'self catering' is that you have the option of eating in. This is a great flat for entertaining in, or just whipping up a luxurious breakfast for you and your crew. Tesco - is about a 25 minute walk down to Canonmills -- take a taxi with your shopping back. Better yet, use their online store and have it delivered! Broughton Street, just down hill and across the big roundabout is home to numerous small shops, including one of the UK's best butchers, Crombies -- a *must* for sausage connoisseurs! The street also boasts a great fishmonger, a branch of Real Foods, an Oddbins and the even better Ville Neuve Wines, and the excellent London Street Grocery at the bottom of Brought St which has some of the freshest produce in Edinburgh. There is also a small grocery store on Waterloo Place with some essentials. 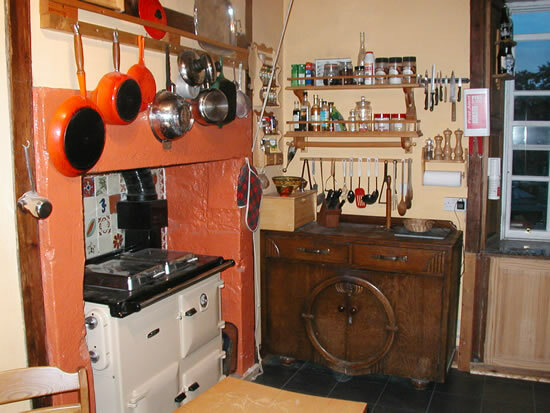 If you've never cooked on a cast-iron cooker such as the Rayburn (like an Aga) then you are in for a treat, but you need to learn a few tricks. The cooker is always on. That means there is always a low heat coming from it -- great for keeping the hot water hot, drying clothes and warming food. Never turn the 'cooker' knob to 'off', you will lose your hot water! If you just want to warm up some coffee, tea or milk, just put it on a saucepan on the hob. A few minutes later voila! Almost as fast as the microwave. Remember, the hob is hotter to the left (as you face it) than to the right. Reheating cold pizza, curry (nan bread!)? Just pop it into the oven for 10 minutes. Freshen stale bread by spraying water on it and putting into the warm oven -- almost better than fresh! Make toast by putting the bread directly on the hob. Comes out better than the toaster! For serious cooking, you need to pre-heat the oven for about 30 minutes -- see the temperature gauge. Get up in the morning, turn the oven on, take a shower and then cook a serious fry-up! Yumm!